Background: Chronic and non-communicable diseases such as non-alcoholic fatty liver diseases, non-alcoholic steatohepatitis, obesity, diabetes, cardiovascular dysfunctions, renal insufficiency, alcoholism and other inflammation disorders often lead to severe organ damage. Fibrosis, on the contrary, is a complex phenomenon that may turn into critical conditions if not treated properly. Several biochemical pathways and signaling molecules, for instance, TGF-β, ECM, MMPs, Collagens, MAPK, AP-1, SMAD and NF-κB are responsible for the pathophysiology. In addition to these, inflammatory and pro-inflammatory cytokines are also blamed to be responsible in catalyzing fibrogenesis. Methods: The information was basically searched using PubMed, Google Scholar and Science Direct and put all together to correlate fibrosis pathophysiology. Only recent publications were targeted to show protective roles of Resveratrol in animal studies and human subjects. Findings: There is no effective treatment tactic available for curing fibrosis since multiple factors are associated with its progression; hence, it remains a big question to be answered by current healthcare associates. However, cell-based therapies have been showing quite effective approaches and are being suggested to counter fibrotic conditions. It is, however, highly expensive and complicated procedure and unfortunately, the availability of the strategy is limited worldwide. On the other hand, Resveratrol, a naturally occurring polyphenol which is largely being investigated in various animal models, cell cultures and human trials and thereby found highly potential in preventing measure against fibrosis. Conclusion: Our current study, therefore, tries to establish some molecular pathways which are responsible for the progression of pro-fibrogenesis and fibrosis. 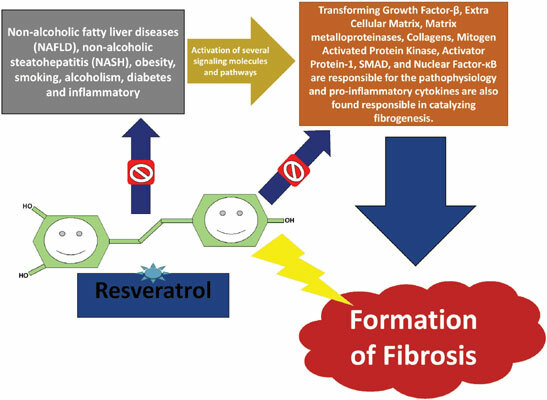 Our findings would also explore the possible inhibitory role of Resveratrol alongside fibrosis. Fibrosis, TGF-β, collagens, MAPK, NF-κB, Resveratrol.